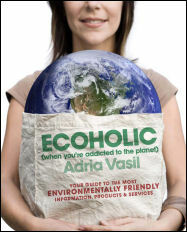 Adria Vasil has been writing the Ecoholic column for NOW Magazine since the spring of 2004 and has covered environmental issues for NOW's news section for four years. Vasil has a degree in development politics and cultural anthropology from the University of Toronto and a degree in magazine journalism from Ryerson. An advocate for the earth, women's issues and human rights since her teens, Vasil has appeared on MTV Canada, Much Music, BookTV, and CBC's Newsworld to promote environmentalism. When the world's environmental woes get you down, turn to Ecoholic - the best new resource for practical tips and products that help you do your part for the earth. You'll get the dirt on what not to buy and why, and the dish on great gifts, clothes, home supplies, and more. Based on the popular and authoritative "Ecoholic" column that appears weekly in NOW Magazine, Ecoholic is a cheeky and eye-opening guide to all of life's greenest predicaments. Learn how to choose the best green products for the home and for renovations, and find what works for you and mother earth in the kitchen, garden, and office. Find out what the smartest products are for your baby, your pet and your own body. Ecoholic teaches you what's green (not just 'green-washed') from cleaning supplies to furniture to sporting goods, from cookware to beauty care to fertilizer. Some products might help save you along with the planet. Ecoholic contains the most current information about avoiding toxins in the home, buying pesticide-free food plus sustainable seafood, meat, and veggies. 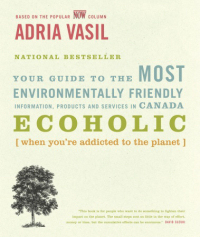 With valuable advice on reducing your energy and water use, green gift-giving, taking 'eco-tourism' holidays, and even greening up your love life, Adria Vasil has all the modern environmental advice in one spot. These days, to go green you don't have to go it alone: Ecoholic contains information about the best and most helpful services to help you stay environmentally friendly. Electronics recyclers, alternative energy suppliers, organic food delivery, hazardous waste disposal, even green general stores: these guys are all around to help you green your life and Adria Vasil knows where you can find them.